1. The business name of Foxtons House Clearance. 2. The services undertaken by Foxtons House Clearance are described by the term House Clearance. Ownership of any items removed from the property transfers to (Foxtons House Clearance) our company to disposal as we see fit. Details of any items of furniture or contents of the house which are large, heavy or unusual. 5. 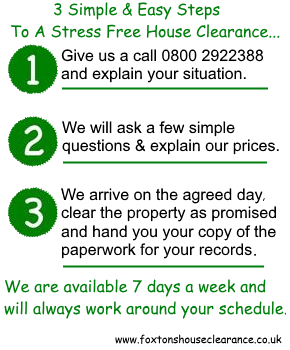 Based on the information given in part (4) a fee will be quoted for the House Clearance. This fee will include the typical house clearance service, and any other specific add ons specifically discussed during the conversations and agreed with us. 6. The House Clearance fee will also include up to 1 ½ tonnes of waste removal and disposal (1 load). We (Foxtons House Clearance) have found from experience that this weight covers the clearance of most average houses. If it looks likely that there will be excess weight then we (Foxtons House Clearance) will endeavour to bring this to the client’s attention at the start of the Property Clearance, or as soon as it is recognisable and any extra loads that we carry out (another 1½ tonnes of waste) will be charged at half of the original price. 7. If any of the information requested in part (4) concerning the House Clearance is omitted, misrepresented or withheld then we (Foxtons House Clearance) reserve the right to charge an additional fee. The fee quoted will be based mainly on the anticipated time to clear the property, and the quantity and weight of items for removal and disposal. If any factor comes to light, not previously disclosed, which will increase the time taken to carry out the House Clearance, or will increase weight/volume of items requiring removal then a fee will be charged to cover these costs. 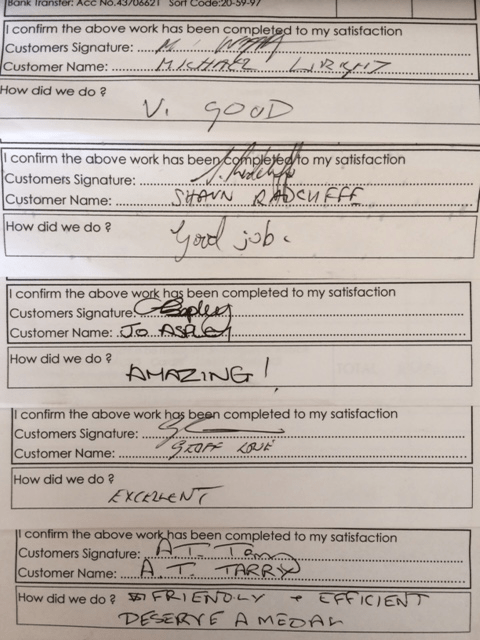 As before, we (Foxtons House Clearance) will endeavour to bring this to the client’s attention at the start of the Property Clearance or as soon as it is recognisable. 9. Unless instructed otherwise, in a typical house clearance, we (Foxtons House Clearance) will leave carpets. If you require carpets to be uplifted, please agree this in the conversations prior to the fee quote. On occasion we (Foxtons House Clearance) may suggest uplifting carpets if they are in a particularly poor or smelly condition. We (Foxtons House Clearance) would do so on the belief that either removal will assist the sale of the property, or from previous experience that Housing Associations and councils will levy you as the client for the uplift, removal and disposal of any carpets. 10. We (Foxtons House Clearance) may charge an additional fee towards the removal of fridges and freezers (unless agreed otherwise) due to restrictions regarding disposal of these items. 11. House Clearance Jobs are not written into the diary until the client specifically confirms that the house clearance is “booked”. 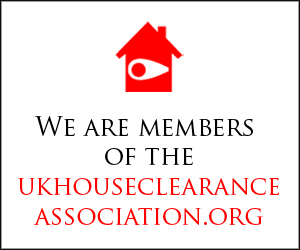 At this point we (Foxtons House Clearance) will book in no other House Clearance for the date in question, and we (Foxtons House Clearance) will not book in House Clearances on adjoining days which would mean that we (Foxtons House Clearance) would not be able to undertake your House Clearance job as agreed. 12. The fee payable is due upon the completion of the House Clearance. We (Foxtons House Clearance) require payment by either card, cash, cheque or direct payment in to our bank account. 14. We do not allow people to have accounts, all payments need to be settled on the day of the clearance unless paying by bank transfer which is within 7 days. You (the customer) understands that any ‘late payments’ may be subject to additional charges. If payment is not made after 7 days of the invoice then the account will be passed to our collections team, after which a charge of 15% on top of the initial invoice due, will be added to the debt. You agree as part of this contract to pay this sum which represents our reasonable costs in collecting the unpaid amounts. 15. For House Clearance services, you will be supplied with one copy of a invoice. If you require any further documentation or additional copies of invoices please email your request to us at foxtonshouseclearance@gmail.com. 16. From the point that at house clearance is “booked” we (Foxtons House Clearance) will be turning down other House Clearance work with regard to the dates in question. It also means that the week’s work will be scheduled geographically to fit into a cohesive route and schedule. 17. Therefore, any cancellation of a House Clearance within 24 hours of the date booked will result in additional expense, and loss of income for us (Foxtons House Clearance). We (Foxtons House Clearance) would in such instances require a cancellation penalty of 50% of the fee quoted. Payable by Cheque or direct payment in to our bank account. This applies to all customers. Please read and understand our terms & conditions.